Need more information about booking Home 6747644 ? Comfortable and stylish, bright and spacy studio apartment located on the first floor of the detached house in a quiet residential development off London Road in Central Headington, offering a luxury space for those wishing to have their own Oxford hideaway. Smartly designed apartment includes a very elegant and modern open plan kitchen/dining/living area and en-suite bathroom. The good size studio is well-decorated in neutral tones and furnished with a standard double bed, a bedside table, a double-seated sofa-bed, a dining table with chairs, a flat screen TV/DVD and a wardrobe. 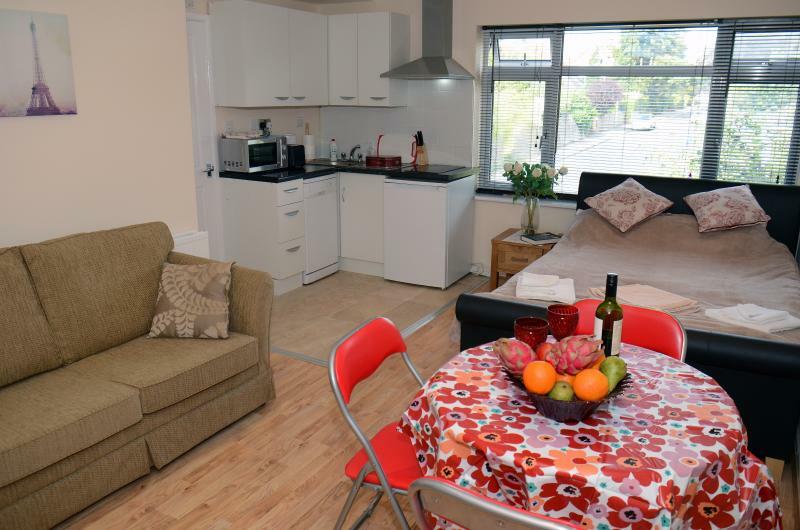 The kitchen area is comprehensively equipped with all the modern appliances including a cooker and a hood extractor, a microwave, a fridge with a freezer, a dishwasher, a washing machine and fully prepared for home cooking and excellent dining. a sink, a toilet and complete with toiletries, bath sheets and towels. This Apartment has 1 bedroom, 1 bathroom and sleeps 3. It’s been listed on Holiday Lettings since 16 Aug 2015. Located in Oxfordshire, it has 2 reviews with an overall rating of 2.5. The average weekly rate is £516. You can get in touch with Oxford (the owner) through the contact form on this page. Send Oxford (the owner) an email through the contact form on this page. Alternatively, if there’s a phone number on this page, you can call them. How do I contact Oxford (the owner)? If you’ve already booked, go to Manage your holiday booking to view Oxford the owner's contact details or send them a message. Or send Oxford (the owner) an enquiry through the Contact the owner/manager form if you’d like a quote or more info first. When you pay online through the Book your stay form, a booking request is sent to Oxford (the owner). You’ll find out within 24 hours whether they’ve accepted - no money will leave your account before then. You can also request a quote from Oxford (the owner) through the contact form. The owner will email you the total cost for your dates and a link to book and pay online. Use the Book your stay form to pay provisionally online. You can pay by credit/debit card or PayPal. Oxford (the owner) will have 24 hours to accept the booking and no money will leave your account before then. Why can't I call Oxford (the owner) before booking? You’ll need to contact Oxford (the owner) to do this. Send them a message in Manage your holiday booking or through the contact form on this page. You can request to change the dates or number of people on your booking via the Manage your holiday booking page. To change your holiday dates use the Edit booking button. If you need to change the number of guests staying then send Oxford (the owner) a message. If Oxford (the owner) agrees, they’ll send you a revised quote outlining the changes. You can review and accept/decline this from the Manage your holiday booking page. You’ll have 48 hours to take action before the revised quote expires.